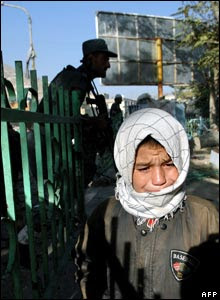 I have lost count of the number of suicide bomb attacks in Kabul let alone the number of casualties. Yesterday, another suicide attack took place in Karte Parwan near Cinema Baharistan killing 27 police (numbers continue to rise). 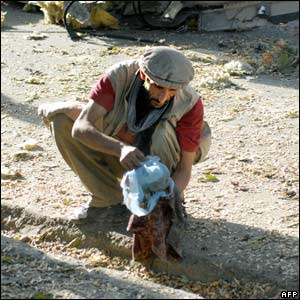 Reuters reported 10 killed, a flimsy portrayal of the tragic imposition of the bombing. 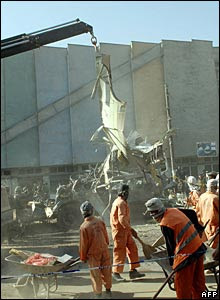 Other sources immediately reported 27 dead. If the same situation occured in a western country, the ‘estimation’ would have been doubled increasing social alarm. However, Afghanistan continues to be forlon and Afghan blood contines to spill unnoticed by the world. I will say no more, let the photoes speak. It saddens me to think about who have been killed. Men who have joined the army only to provide for their families, recipients of US$70 month wages. Fathers, uncles, brothers. all sole income earners for their families. I have mentioned this before and i will entrench it again, men here play multiple roles in a family. Unfortunately, sadly but truly, women find it formidable to persevere in life without a male figure in the home. My heart goes out for these women. But i also admire the strength, courage and determination of those women who continue to struggle and strive for the future. Women who perpetuate the family name in a dignified and honourable manner. The mothers and wives of Afghanistan. Unfortunately for some, most women who have lost their husbands tend to wander off and remarry leaving behind her children in the care of their paternal relatives and never hear from them again. One can only imagine the preceding occurences which a mother is forced to endure which results her in abandoning her children. Later that day, i took my aunts shopping. Kabul streets continued business as usual- shop owners sold, beggers continued to beg and shoppers continued to shop. They have become so desensitised to attacks, it no longer frightens them but the anger is ensued. We returned home in time for Iftaar. Again, visitors continued flowing in. Its afghan tradition to continue catering for people following the death of a family member for forty days. It’s appalling. We don’t get family time alone. But it’s Ramadan and it’s a blessing to have visitors, so for that i’m grateful. Mum gives food away to those in need, like our maid. A young Hazara girl. Their family is ever so grateful for it. She told us of her story- her neighbour had little food to break her fast with so they came knocking on her door. They had nothing to give away except sharing the food which my mum had given to them. I can’t stand wasting food. Even in Australia, I felt very guilty throwing food away. Ba omideh roozegaareh behtar, ba omideh azaadi millate Afghanistan. If the sky is not in love, then it will not be so clear. If the sun is not in love, then it will not be giving any light. If the river is not in love, then it will be in silence, it will not be moving. It’s official (according to me) winter is here! My jacket has come out and i think soon enough it will be my scarf, gloves and boots. I resent cold weather! But i’m looking forward to snow season. I forgot to mention yesterday, i dreamt of this wall size fish tank. It was the most beautiful piece of work i had ever seen. The glass had a slight convex shape with clear water and excellent lighting. There were goldfishes swimming. Later i had my dream deciphered and it defined success, honour and dignity! thank god. My grandfathers fatiha resulted in a massive turn out. Over 2000 men attended at the mosque to offer their condolences. Ladies fatiha was held at home and the men’s fatiha was held at the mosque. There were politicians, close friends, distant friends- everyone had attended. Among them Mojaddidi (former interim president of Afghanistan, Younos Qanooni (Parliament Chairman), Dr Abdullah Abdullah (former Foreign minister, currently working in ‘Massood Foundation’) and of course Sayaaf. Obviously fatiha’s recieve publicity and is broadcasted on the radio. When my Grandfathers death was mentioned on the radio, it was explained that he was Sayaaf’s cousin. After the event ended, Sayaaf left the mosque when two rockets targeting the first car (Sayaafs car) of the convoy exploded causing minor injuries and shattering the car windows. Thankfully, no killings or major injuries. I got home from work and recieved this news instantly. Overall, we recieved positive feedback from people who had attended saying it was well organised. I felt a little bad, i should have stayed home with my family that day. We spent quality time that evening with my family. Reflecting on old memories with my grandfather. Talking about the good times. Honestly, i dont recall any negative moments with my grandfather. May he be blessed. My fingers have frost bite and it’s very cold. I need to get some work done. Can you see Hamid Karzai? The yellow sarachas (station wagons) are taxis. The famous pakool. Guess who? Qahramaane millee Afghanistan (the National hero of Afghanistan) Ahmad Shah Masood. Near Deh Afghanan or Foroushgah. Its dirty and smelly, but i enjoy it! It’s part of Kabul. It looks like my blog is reaching the public out there. Far more than i think. I was surprised to find my entry quoted in Joshua Foust’s site (http://www.globalvoicesonline.org/author/joshua-foust/). Foust was named Time magazines Person of the Year in 2006. Kabul has been cold the past two days. With winter just around the corner, the warm weather is breaking into cold and chilly winds. This morning i grabbed my jacket before coming to the office- i’m glad i did that. Kabul has suffered another blow. Following the usual trend, the suicide vehicle rammed his car into a convoy of French troops. 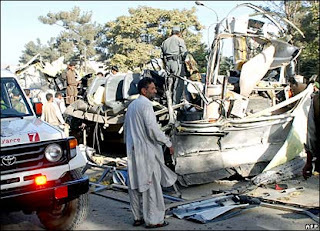 The explosion killed innocent civilians who were passengers in a nearby car. Yesterday, (in Kabul, near Gumruck) the international military forces (IMF) shot and wounded two local drivers who ignored warning orders to stop as the civilians vehicles moved closer to the convoy. Although it doesnt justify the actions of the IMF, it is only relevant to mention that drivers in afghanistan have little acknowledgment for traffic laws including IMF and ISAF orders. I have seen Corollas following convoys almost always too closely, despite having an IMF soldier pointing a gun with one hand and motioning with the other hand to stop or keep distance. In turn, the forces fear a suicide attack and shoot before being shot at. No doubt, it creates delays and frustration having to follow a convoy at a distance. But the IMF are here and they are going to shoot, it’s only wise to follow orders. IMF or ISAF shooting at civilian cars ‘mistaking’ them for suicide bombs is not a new trend and has been occuring for quite some time. It just doesn’t make it to the media as much as the deaths of IMF does. Anyways, i better go and pray Zuhur. I’m fasting and really hungry. On a completely different note, i feel like i have been lied to. I hope i’m wrong. Time will tell all. I dedicate this poem to my grandfather. May he RIP. At last you have departed and gone to the Unseen. What marvelous route did you take from this world? Beating your wings and feathers, you broke free from this cage. Rising up to the sky you attained the world of the soul. You were a prized falcon trapped by an Old Woman. Then you heard the drummer’s calland flew beyond space and time. As a lovesick nightingale, you flew among the owls. Then came the scent of the rosegarden and you flew off to meet the Rose. The wine of this fleeting worldcaused your head to ache. Finally you joined the tavern of Eternity. Like an arrow, you sped from the bow and went straight for the bull’s eye of bliss. This phantom world gave you false signs But you turned from the illusion and journeyed to the land of truth. You are now the Sun -what need have you for a crown?You have vanished from this world -what need have you to tie your robe? I’ve heard that you can barely see your soul.But why look at all? -yours is now the Soul of Souls! you fell upon the rooftop of this world. Then you ran in every direction and escaped through the drain spout . . .
Now you have gone to rest in the arms of the Beloved. One of my most dearest family member passed away on Friday on the 2nd day of the holy month of Ramadan. My paternal grandfather with whom I lived my entire life to the true definition of the word had passed away gracefully. I grieve not, but find splendour in the memories. God granted his wish. he passed on during Ramadan on a Friday, five minutes prior to iftaar. he was in coma for a few days before taking his final breath. the doctors had given up on him saying that there is no possibility for him to awake from coma. Five minutes before iftaar, he opened his eyes and said nothing more but Allah Allah Allah… just before taking his final breath, he smiled. Perhaps he saw visions of angels or paradise. He didn’t move, he didn’t die a painful death. God truly loved him. Before dying, he had only two words of advice- Islam wa Itifaaq (unity). he also wanted to be buried in Afghanistan, near his orchard. A wish which was granted. Kabul International Airport- 3 hour wait. On Thursday my aunts and uncles arrived from Australia with grandads coffin. Ustaad Sayaaf had organised for a funeral car, his government cars and police cars to assist in the smooth transition of the situation. My relatives were to spend the night in Dubai but Ustaad Sayaaf had instructed Ariana Airlines to take up whatever means possible to ensure that my relatives didnt miss the flight. this resulted in delaying the flight for three hours. most passengers were annoyed at my relatives. I was waiting for hours at the airport. i managed to enter into the terminal (something no one was allowed to do unless you have a flight). Finally, they arrived! we hugged in turn as we cried softly. the cars were brought to the terminal (Again, no afghans were allowed but i guess it was all Ustaad Sayaafs magic). i was dreading home, afghan women have the tendency to wail and scream. Some even pull their hair out. Something i am not accustomed with. we got home, the house was filled with men and women. no room to walk. i went upstairs to see how my grandmother was doing, but thankfully my grandmother had taken the news easier than i expected. Ustaad Sayaaf was downstairs, he loved my grandfather very much and holds deep respect for him. His presence meant a great deal. His life was at risk, yet he still attended. My grandfather had wanted Sayaaf to lead the funeral prayers, which Sayaaf gladly accepted. Someone came in and told us that Sayaaf wanted to see my grandfathers children alone, in private. i went along! it was my first time seeing Sayaaf. he was tall, of large build and well dressed. i would say beneath all the facial hair and despite the old age, he was handsome and what afghans call noorani. my aunts greeted him, kissing his hand as a sign of respect. In most cases the elders would either pull back and won’t allow kissing of the hand (a gesture of humbleness) or they would kiss the face/head of the younger person. Sayaaf didn’t. when it was my turn, i maintained my dignity by greeting him from a distance (i wonder what crossed his mind since i didn’t kiss his hand AND i was the youngest in the room). i didn’t mean any disrespect, i just didn’t see any reason as to why i should. There was much to learn about this man. i respected him, but the only male person whose hand i kissed was my grandfather and my father. We sat in silence. Ustaad Sayaaf cried, i saw him wipe away his tears as he gave us advice which strengthened us. he said very little. we continued to sit in thunderous silence. Eventually he stood up, asking to be excused. he left the room with his companions. we reunited with the ladies. The day went on and the house was filling by the minute. It was iftaar time, the cook had set everything. I was a little annoyed. My aunts and uncles had arrived from overseas, seeing my grandmother after 6 months AND there was a death in the family. i expected the visitors to be a little more considerate and allow for family time together so we could grieve alone. at least for the first day. but i guess not! They stayed for iftaar, some spent the night. This was Afghan culture, something i needed to learn and adapt to. We wanted to see my grandfather but they said to wait til the next morning. They didn’t want to leave him in the open for too long. so the coffin stayed closed. I couldn’t believe it. the last time my grandfather was at our house, he was alive and breathing. now he’s lifeless in a box, in a coffin. The very next morning, 600am the house was awake. my eyes shot open. my sister was asleep beside me, sharing my double bed. she woke up as well. people were downstairs, they had uncovered the coffin. i jumped out of bed. ‘are you going?’ my sister asked. ‘yeah for sure,’ i replied as i quickly undressed from my pajamas and into something more appropriate. So did she, we didn’t say a word. Both of us managed to finish at the same time. i grabbed my white scarf as i rushed out the door pulling it over my head, covering my hair. i dont know why we were running. with unwashed faces we bolted down three flights of stairs. we reached the third flight- the final flight. that’s when i stopped. i peeked and saw my grandfather lying peacefully in his coffin. my grandmother had her head resting to his right on the coffin, weeping silently. other women surrounded her but none felt her loss. Some were reading quraan. some were crying loudly. i slowly walked down the stairs in a bit of a shock, my sister behind me. i went closer to my grandad, people moved as my sister and i made our way through. my eldest aunt was there, she held me tight as tears came down my cheeks uncontrollably. My grandad resented screaming and wailing near the dead. he always told us not to scream. Despite being a week since his death and the impact of travelling, he looked so peaceful, his face was glowing. His white beard, his skin, his tall height dressed in white kafan. he looked holy and heavenly. he really was smiling. i stood by his coffin as women sobbed. i held my grandmother. i thought of the good times we shared. My grandfather was the one person i held deep respect for. i never spoke back to him or displeased him. he was like a friend to me. i lifted my head to look at him, he looked like he was asleep, i expected him to awake any second. but he didn’t. thats when it hit me. he’s gone forever! my aunts consoled other women, asking them not to raise their voice as it will cause him discomfort. Ladies read the quraan loudly. They recited Surah Yasin. My aunt finished reading, i sat by my grandads coffin opposite my grandma and opened the quraan. i started reciting softly next to him, unsure whether he could hear with all the sobbing. but i recited anyways. I felt very lucky to be able to read the Quran for him. i finished reading Yasin and passed the Quran to my sister. My maternal grandma sat next to me and recited Surah Yasin in a beautiful voice which made many cry. I was sitting beside her and joined her in the recitation. She then raised her hands and other women did too and made dua for him and asked God to grant him Jannah and to strengthen his family. Ameen. We continued with Surah Alrahman together, sharing the Quraan. Leaving for his resting place. Soon it was time for him to go to his final resting place. We kindly asked the rest to leave for my family to spend some time alone. My uncles and my dad accompanied us. We said our final good byes. it was hard for my grandmother. but she was strong. They had a very loving relationship. my grandfather wooed her and was very romantic. My grandfather used to tell me stories of how he fell in love with her. my aunts took my grandmother away. i was left with my uncles and my dads cousins daughter. My dads cousins came and prepared my grandfathers coffin to be taken to the funeral car. My dad and my eldest uncle looked on, crying. i hugged my dad and cried, this time much more than before. My dad whispered in my ear, ‘sabr… sabr jameel’ (we speak in Arabic) i kissed him on the cheek and my uncle held me close to him as i continued crying. I didn’t want to say good bye to my grandfather, it was all too soon. I walked away from the coffin without seeing my grandfather, i didnt want to weaken. i needed to be strong. i didnt need to say good bye, he was still with us. i could feel him around. my dads cousin pulled me close to her as we made our way to join the rest. the house was full of ladies. i went to my bedroom, locked my door and looked out my balcony. i had never seen that many people in my entire life. It was only half of the men who will be at the funeral prayers. Sayaafs cars and police cars were lined up in an orderly fashion. i watched on. The cars moved further. The funeral car was making it’s way towards the convoy of cars. the police car was first followed by the funeral car and then Sayaafs 4Wds followed by more police cars and then the guests. The roads were blocked. it was very well organised. i know my grandfather liked it very much. Later i learned that 1500-2000 men had attended the funeral prayers which was led by Ustaad Sayaaf. Death- a lesson for all. I have learned many things since his death. I saw with my own eyes that it is only your good deeds and your faith that accompanies you to your grave. It is only Islam which will defend you from the punishments and torments of the after life. as my grandfather said, Islam and unity! In todays world, it’s a real challenge. But it’s the challenge that makes it rewarding! Life is a test, and death is the final exam. My grandfather was a good man. Never spoke ill of anybody, attended to people during their time of need and practised Islam to his maximum capability. As most people said, he was a father to everyone. May Allah grant him Jannatal Firdaws. ameen. I was just talking to a friend and i noticed that Ramadan is just around the corner. I’m looking forward to it (as always). Its full of tranquility and good faith (i become an angel! but i’m no devil either…). it’s my first time ever experiencing Ramadan in an islamic environment (unless i did when i was in Saudi as a child). But it’s the best time ever! I can’t wait!